How to remove SAVE ALL button? How to remove or to move this button, sometimes i press it by mistake and the nightmare begins. I don’t use it but I think the Customize Toolbar plugin can probably assist you with this task. No, i don’t see that kind of function. i didn’t know it’s a plugin. You didn’t know it’s a plugin?? As to why it gives you that error: You probably use 64-bit Notepad++. 32-bit DLLs (i.e., plugins) are not compatible with 64-bit programs. It appears the Customize Toolbar plugin is currently only available for 32-bit. 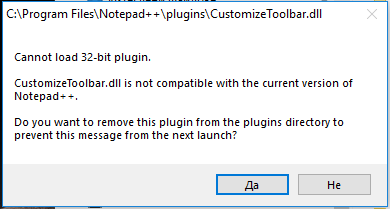 If removing the Save All button is that important to you, I would suggest using the 32-bit version of Notepad++ so that you can use the plugin. But this system not allowing me to post or update until someone else write a post.